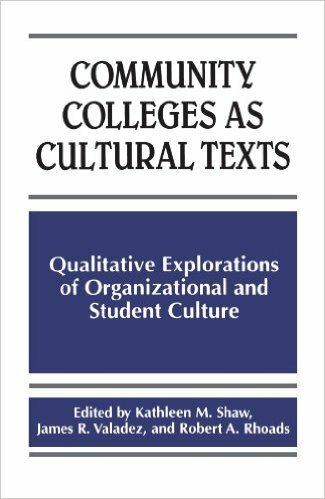 Community Colleges as Cultural Texts (Shaw, Valadez & Rhoads, 1999) has already proven to be a valuable resource for my continued studies. Offering different approaches to the concept of identity, social justice and culture, each chapter, authored by different scholars, critically analyzes the way identity and culture shapes the ways colleges relate to their student populations. The chapter titled, “The politics of culture and identity: contrasting images of multiculturalism and monoculturalism,” by UCLA professor Robert A. Rhoads, is the chapter reviewed for this essay. The major idea Rhoads’ chapter offered is that community college leaders need to understand that students thrive within an environment that not only acknowledges difference among their student population, but legitimizes the cultural difference among the student population by acknowledging the culture of the people as normative within their learning environment. This normalizing goes beyond mere inclusion and happens when students are given opportunities to share, express, and contribute to the learning environment as valuable resources who are expected to add their perspectives to the learning landscape. As Rhoads believes, “we need to recognize that teaching and learning is a contextualized process in which certain cultural forms become legitimized through their inclusion or delegitimized through their absence” (Rhoads, p. 121). Rhoads (1999) explained his main idea in his research-based essay by illustrating with qualitative data from his study of Western Community College that who we are, or believe ourselves to be, shapes the way that we interact with others on a daily basis. If a college employee perceives the behaviors and choices of their students as being less than desirable, then, that college employee is automatically inclined to attribute those perceived behaviors as definitive of the culture from which that student comes. Rhoads (1999) presented this as a power dynamic that works to the detriment of the student who does not have the authority to counter the bias of the college employee, and who may not even be aware that this perception is shaping the way in which this college employee is relaying information about opportunities, or even making choices when teaching information. Rhoads (1999) stated that, “the assumptions we have of the other (and necessarily ourselves) are revealed through the educational interactions and endeavors we adopt in relation to our students” (p. 107). I was trained in Advancing Youth Development (AYD) theory in 2005 while working in the nonprofit sector and became familiar with the term “adultism”, bias favoring adults over youth that rang familiar when reading this part of Rhoads’ chapter. Although all of our students may not be youth when becoming students, they are more likely to be treated as less capable than the college employee providing the service, with rare exceptions that are often due to the students’ visible alignment with what the college employee deems worthy to acknowledge. My training in AYD has impacted greatly the work that I do currently as a college administrator, equipping me with the training to acknowledge my students as participants in their learning experience. This means that their experiences that have shaped them to who they are now are useful in shaping their future and contributing to the learning environment during their matriculation. I create learning environments that encourage sharing, expression, and inquiry. Another point that Rhoads (1999) addressed was the need for docility be present or a cultural shedding to take place for students of diverse cultural background to be perceived as a worthy student. Rhoads summarizes that an imbalance of power exists within the learning environment and all too often students of color are expected to disconnect from their culture in order to fit in to the Eurocentric paradigm in order to be considered for access to opportunity within the campus community. Despite the often diverse make-up of college campuses, the faculty and staff do not reflect such diversity. So, what happens is the student population that contains people who reflect diverse value models, cultural traditions, abilities, and experiences are crunched into the narrow lens of the faculty who may or may not have respect, interest or useful need for the values, traditions, abilities and experiences of their students. Therefore, the students may or may not lose out on opportunities that could widen their possibilities as students and as graduates, and the college employee remains trapped inside their limited belief about the student who is different from them because “culture not only establishes the parameters for social interaction, it also provides a framework for how we define ourselves in relation to others. Definitions of the self and the other contribute to how identities are represented and understood” (Rhoades, (1999), p. 106). This last point of Rhoads’ resonated strongest because even within the HBCU I work and the community college I used to work at for three years, where both faculty and students are majority of African descent, cultural bias is rampant, requiring students to adopt a capitalist Euro-American persona to be successful as a student and in the world of work. At the HBCU, any of the college employees are graduates of the school and have continued a cycle that demands the disassociation of cultural markers to ensure success. In observing this, I have seen how the campus community misses benefiting from some of the cultural practices that could possibly impact for the better matriculation rates among all students if incorporated into programming and policy and could connect students to a richer classroom experience if the faculty were trained in ways to approach teaching from a culturally inclusive perspective. I believe that Rhoads’ essay explores the ways that identity is used against the student as a learner as it positions them into a position of vulnerability. This positioning impacts any ability the student has to advocate for themselves and colors the way they view themselves as agents of change implementing actions of social justice.